I recently saw a brilliant Bernie Sanders campaign video with a genuinely rousing speech by a Black rapper named Killer Mike. 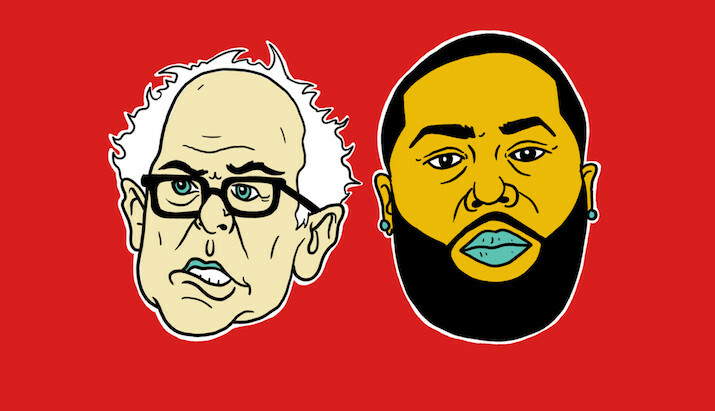 In it, Killer Mike shows a very short soundless video clip of a couple of young Black women at a Sanders rally. In the clip, Sanders appears to willingly give the stage over to these innocent young women, who according to Mike, only wish to be heard. Sanders being wise and benevolent, as well as deeply concerned for Black folk, appears to listen attentively to the pair as they tell their story to a mindful Sanders, who earnestly absorbs their wisdom because he cares. Killer Mike then tells how Bernie Sanders has been involved in civil rights struggles from the very beginning of the movement, walking hand in hand with Dr. King. He then shows the audience a series of photos of dramatic moments in civil rights history, including a rally from the 1960's of Sanders being dragged, kicking and screaming by the police. There is one clear message in all of this; Bernie Sanders is a righteous man, concerned for the well-being of all, even poor, young Black girls. There's just one problem, it's a complete fiction. ​What Killer Mike doesn't do is show the actual video intact, which is readily available and was already big news a few months ago, showing these same young Black woman taking over a Sanders rally, shouting and screaming typical "Black Lives Matter" rhetoric about racist cops and White motherfuckers. This they do repeatedly, referring to Sanders, his supporters and everybody else in the primarily Caucasian audience in exactly those terms. Bernie's response to this circus isn't attentive silence. No, Sanders sheepishly abandons the stage to these racist harpies, demonstrating all the backbone of a gelatinous marine animal. But, if you didn't see the full video, the truth can be played with like Thelonious Monk improvising on a Bach fugue, which Killer Mike does brilliantly. Proving one thing, no matter who we are, we can be manipulated, especially if we have only one side of the story. Two sides is always better. Three and more, better still.